The goal of impak Finance is to build a socially responsible bank that will only work with companies that are on a mission to change the world for the better. This pioneering digital bank will provide a level of transparency unheard of in the banking sector, also eliminating the need for transaction fees. If you want to be a part of impak Finance, you can contribute to its upcoming ICO by purchasing impak Coins (MPK), which can later be used for purchasing products and services from companies that collaborate with impak Finance. Read our in-depth impak Finance review to learn more about the project. impak Finance’s team consists of a significant number of experts. The company’s website features 24 people who are involved in the development of the impak.eco platform. Paul Allard is the president and one of the co-founders of impak Finance. Mr. Allard has over 20 years of experience in managing and funding new companies. Most of the companies he ran and co-founded belong to the media and technology industries, including Engagement Lab, etc. Besides Mr. Allard, there are 8 other co-founders, including Phillippe Gablain, Tima Gros, Jean Oulhen, Armen Ouzounian, Stéphane Dumont, Andy Krupski, and Kosta Kostic. Phillippe Gablain is the chief technical officer and chief product officer, Tima Gros is the chief happiness officer, Jean Oulhen and Armen Ouzounian are banking ecosystem architects, Stéphane Dumont is the head of marketing, Andy Krupski is the trust marketing officer, and Kosta Kostic is the senior legal counsel. The co-creators of impak Finance are Audrey-Anne Chartray, campaign coordinator, Eddy Hugues Hodonou, mobile alchemist, Francois Le Bel, impact capital builder, Samuel Bedard-Venne, data druid, Pierre Etienne-Vachon, banking express catalyst, Adrian Caranta, full-time multitasking ninja (yes! ), Thomas Lagorce, user advocate, Corinne Roy, HR and administration director, Hugo Caron, designer and art director, Sonia Howa, product maven vocalist, Eamon Leonard, community architect, Boris Couteaux, corporate relationship catalyst, Morgan Aubert, back-end jedi (yes! ), Adrian Girault, criteria analyst, and Eve Montpetit, network igniter. impak Finance’s advisory committee includes Bill Young, Pierre Valentin, Marguerite Mendell, and Assaf Weisz. As previously said in this impak Finance review, this company wants to improve banking by creating the world’s first digital bank, Canadian Schedule 1 Bank. impak Finance only wants to work with businesses that can somehow improve our society or help preserve the environment. Their main principles are integrity, transparency, and collaboration, which is admirable in itself. They hope to make a difference by attracting as many impact businesses, entrepreneurs, investors, partners, and citizens as possible. Their preferred sectors include sustainable agriculture, real estate, renewable energies, environment and water, financial sector, health, and non-profit – industries that can significantly enhance the life quality of the general population. impak Finance is currently working on launching impak Coin, which will be the first cryptocurrency used for the growth of the impact economy. The first stage of their project is to launch impak.eco, a digital platform that will allow interested parties to join and support the impact economy. The second stage is to launch the bank. It’s expected that impak.eco will gather up to 400 businesses by December 2017, which will all use the impak Coin. impak Finance wants to revolutionize the financial sector, which is reason enough to join this inspiring project. The bank they want to create will invest your money in projects you really want to succeed – those that can help your community and the society as a whole thrive. Of course, they also want to make a profit but not at the expense of hurting people or our planet. Due to their interest in contributing to good causes and sharing the word about the impact economy, impak Finance will develop a platform that’ll gather investors, businesses, and citizens who share the same goals. To make sure that all the companies on impak.eco meet impak Finance’s criteria, the company has developed the impak Scorecard, which will determine each company’s level of impact. The Scorecard evaluates businesses according to four criteria, including governance, environment, economic sustainability, and well-being of employees and community. This is how companies will become accredited Merchants. The impak Scorecard is important because investors will be able to easily find a company they want to support. Similarly, customers will be able to look for companies whose products or services fit their needs and preferences. As for impak Coins, they bring a myriad of benefits to their users. As stated at the beginning of this impak Finance review, you can use the coins to purchase products and services from accredited businesses. With MPK, transactions and fast, taking just a few seconds, and highly secure. impak Finance guarantees the coins’ stability, with the supply of the coins being in relation to the growth of the impact economy. There are no transaction fees and you can convert the coins to your national currency with a minimal fee. Last but not least, impak Coins are more energy efficient than any other cryptocurrency. impak Finance has yet to announce the dates of their impak Coin presale and crowdsale. Any individual or organization can purchase MPK during the crowdsale. More details will be available soon. Satoshi Fund has published a blog written by the president of impak Finance, Paul Allard, which features his view on the world economy and underlines the benefits of implementing blockchain technology. Mr. Allard also introduces impak Coin. Crypto Gamer’s impak ICO review contains a comprehensive overview of the project and comments about its potential. impak Finance channel provides useful videos that explain the project and present impak Coin and its advantages. There’s also a video of a webinar that elaborates on the whole project, including its ICO. Most of the videos are available in both French and English. On impak Finance’s subreddit, you can find some interesting content about impak Finance. Some of the links lead you to impak Finance’s blog posts about the impact economy and the company’s plan to contribute to this branch of economy. There’s also an article in French about fintechs and how they can change the world economy. impak Finance is working on a transactional social network called impak.eco, prior to launching the first digital bank in the world. The app will be launched at the end of 2017. 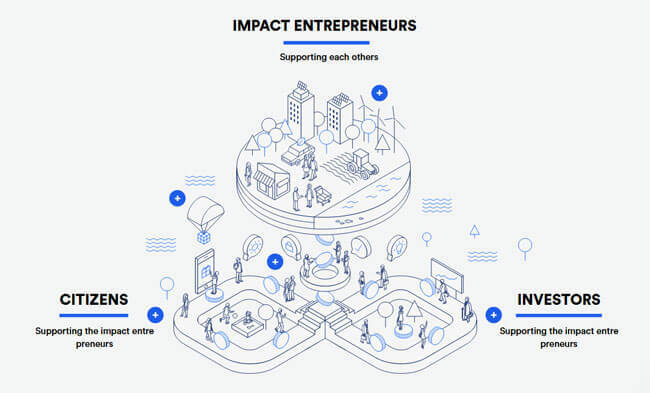 Its main goal is to connect businesspeople, companies, and citizens who want to contribute to the impact economy. Entrepreneurs will be allowed to offer their services and products on the platform while investors will be able to support the projects they like. While impak Finance may seem like a good idea that’s impossible to turn into reality, the project is backed by a number of professionals in the field, who have both the knowledge and the will to make this dream happen. If you want to live in a better world, with more opportunities for everyone, impak Finance is just the project you are looking for.